A luxury wedding villa in Estepona captured the hearts of Phil and Justine. 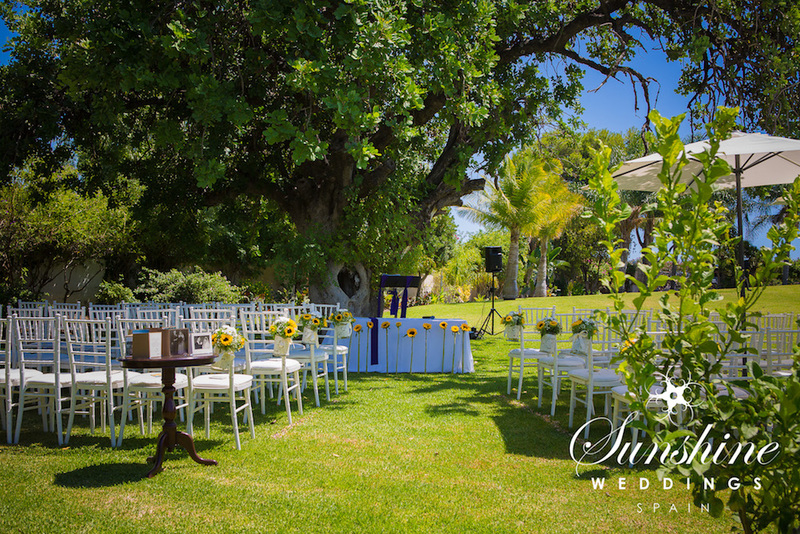 Their dream was always to get married alfresco, surrounded by close family and friends before partying the night away under the stars and Sunshine Weddings Spain were with them every step of the way. Justine and Phil were adamant that they wanted one big P.A.R.T.Y and, boy, did they start as they meant to go on! They arrived in Spain separately, Phil and the boys stayed near Puerto Banús so they could enjoy a full on stag do, while the girls headed straight for the villa in Cancelada. The day before the wedding Scott met with the couple for a pre-wedding meeting, and poor Phil was a little worse for wear, much to everyone’s amusement. Once all the details were finalised all that was left for the couple to do was relax and make sure they were refreshed and ready for the next day. The villa itself is situated on a private road, minutes from the old town of Cancelada. Set in large mature tropical gardens, the grounds offer an abundance of space. Overlooking the fairways of an immaculate golf course, the property boasts extensive jaw-dropping mountain and sea views. It was important for the couple that, although their wedding venue should feel as though it was in the Spanish countryside, it wasn’t so remote that guests had nothing to do. Being located only ten minutes drive from Puerto Banus meant everyone had easy access to endless stretches of beaches, chiringitos and, of course, an abundance of nightlife, of which everyone took full advantage. In part two we find out more about Justine and Phil’s wedding day.